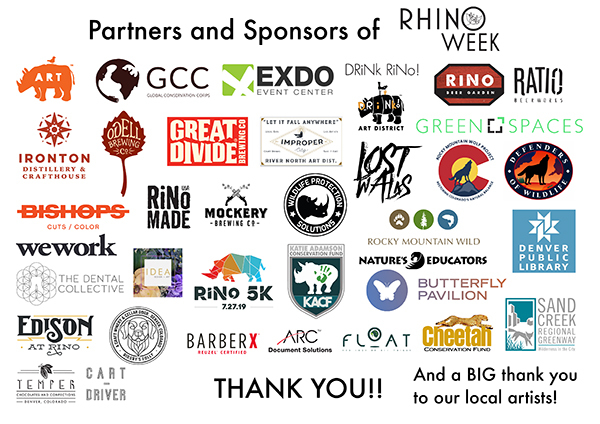 Join us this Earth Day as we launch into a full week of celebration of RiNo’s namesake and one of Africa’s most charismatic and endangered species, the rhinoceros! Following last summer’s “RiNo for Rhinos” event, we are bringing together local RiNo artists, conservationists, wildlife lovers, and the RiNo community to raise awareness and support for Global Conservation Corps, an NGO working on the ground in Africa to save the rhino by empowering local communities! Join us for a happy hour in the RiNo Made Store at the Zeppelin Station for wildlife-themed art, a silent auction, rhino adoptions, and to hang out with GCC’s founder, Matt Lindenberg. You will have the opportunity to learn about all the exciting events occurring during Rhino Week! This event is free but donations are appreciated. Rocky Mountain Wild is partnering with our friends at Rhino Week, to offer a free training for volunteers who would like to participate in the City Nature Challenge. This training will cover the parameters of the challenge, how to use iNaturalist, and information about being the BEST citizen scientist for your neighborhood. This event is part of the Rhino Week Launch Party and will include happy hour and special events to help protect biodiversity on the other side of the globe – because we are all in this together.